Flavor: this tea has many of the qualities that we love in Yunnan teas – a smooth, full-bodied style with lots of caramel, dried fruit and honey. A little hint of peppery-ness & charcoal firing adds a unique taste to the representation of its terroir. We found that this tea (and many other well-made Chinese dian hong) can be successfully re-steeped at least one additional time. This tea gave us about 80% of the original flavor on a re-steep, which is a pretty high percentage for hong cha. Delicious! 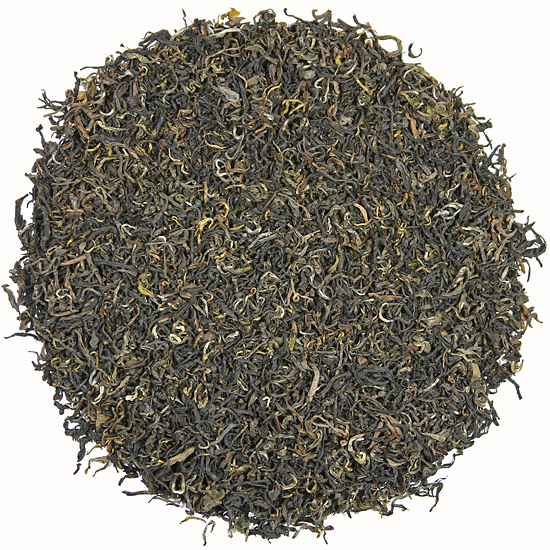 This is a stunning tea, and one of the finest teas from Yunnan that we offer! It is comprised of gorgeously long, needle-shaped leaf tea that is plucked from old Camellia sinensis assamica tea trees on the ancestral lands of the Wa tribal people. A little charcoal-fire in the taste from the finish firing adds to the exotic nature of this tea. This tea has many of the qualities that we love in Yunnan teas – a smooth, full-bodied style with lots of caramel, dried fruit and honey. A little hint of peppery-ness adds a unique taste to the representation of terroir in this tea. The aroma is clean and abundant, typical of leaf material from Yunnan semi-wild tea trees in high-altitude locations. This rich, isolated area shares a western border with Burma and due to its remote location the area has large tracts of undisturbed tea forests and semi-wild old tea trees that are protected by the Wa people. The Wa, along with many other tribal groups in Yunnan, practice a type of animist religion and respect the spirits of the water, mountains, forest and tea trees. They believe that all of these spirits protect them from the forces of the modern world, and in turn, they revere and protect the trees. Tea for them is a deeply spiritual drink and it is considered more medicine than a ‘wake-me-up’ or ‘pick-me-up’ beverage. This tea has been processed the same way that the Wa have processed tea for the last 100 years – picked, quickly pan-dried to stop the enzymatic action, hand-rolled for a bit of shaping, wilted and oxidized for two days and then finish-fired and dried. No modern machinery is used to break up the lovely leaves. The fresh leaf from these tea trees is thick and large and is used to make both mao cha for Pu-erh and dian hong such as this excellent tea. With the exception of the wilting & oxidizing step, the leaf for either of these manufactures undergoes the same treatment. This method of processing creates delicious tea in both types of manufacture. Drink this tea as the local Wa people who oversee the welfare of these tea forests and the production of these splendid teas do: plain and natural.